We briefly met with the Owen’s last week, when I introduced the forthcoming walk for Heritage Week; Cheekpoint’s Industrial Age. This week I wanted to take a closer look at the family. The Owen’s came to Cheekpoint in 1787 to run the Mail Packet Station. Captain Thomas Owen and his wife Jane arrived from Milford in Wales where they, apparently, originated. They raised their family at Fairymount. The family were Quakers, and obviously they would have been welcomed by a strong community already in place in Waterford. We don’t know very much about their lives but when Elizabeth published a book of poetry, Poetical Recollections, in 1826 it gave hints and insights into what it was to live in this era. Whose wild profusion deck’d the verdant glad. Elizabeth’s father died two years later, seemingly after a period of illness while having treatment in London. He had obviously shown a lot of affection and care to his daughter as this excerpt illustrates. All of Elizabeth’s siblings were disowned from their religion. To be disowned meant that a person had acted contrary to the belief’s of the congregation. In Margaret’s situation she married outside her religion to a man named Williams, and from Elizabeth’s Poetry seems to have resided in Wales. Poor hapless blossom nipp’d in life’s young bloom. For thee, ill-fated youth – can also weep. MILFORD, AUGUST 28. – On Tuesday morning last, about four o’clock, Samuel Owen, aged 35, mate of the schooner Economy, of Newport, fell from the top-sail yard of that vessel on deck, and was killed on the spot. The schooner was near the harbour’s mouth, on her voyage for Cork. He was a native of Cheek Point, near Waterford, and son of the late Thomas Owen, Esq. many years agent for the Post Office Packets plying between this port and Milford. I could not find, as yet, any record for Williams death, but Elizabeth died 13/12/1836. Up to now I have only found a line in a newspaper recording her death as being in Waterford, most probably at the family home in Fairymount. I have yet to confirm the last resting place of the family. Its a quest I would like to fulfill. I’d like to ensure her poem entitled My Grave, is bourn out. Particularly as the wild violet is one of my favorite flowers. Please join us on Saturday 22nd August at 5pm at Cheekpoint Quay to explore more of the poetry of Elizabeth Owen and Cheekpoint’s Industrial Age. In 1785 Cornelius Bolton along with other investors bought out the Mail Packet Station, then based at Passage East and moved it upriver to Cheekpoint, Co Waterford. Around this business, Bolton built a vibrant industrial village. The man who came to run the Packet, a Welsh Quaker named Thomas Owen arrived in 1787 with two cutters and his family. His youngest daughter Elizabeth recorded her observations of the village and her family in poetry and in 1826 published a book entitled “Poetical Recollections”. For this years Heritage week, Cheekpoint Fishing Heritage Project, which has participated in Heritage Week since 2005, will partner with Russianside Tours to provide a walk and talk entitled Cheekpoints Industrial Age as perceived through the poetry of Elizabeth. It will be held on Saturday 22nd August 2015 at 5pm and commences at Cheekpoint Quay. Waterford has a wealth of early Industrial Heritage which we can sometimes ignore, despite the evidence being right before our eyes. A report from Dublin Civic Trust highlights this in the county of Waterford but alas doesn’t include much of what occurred at Cheekpoint. We have met Cornelius Bolton and the list of his and his fathers achievements before. Cheekpoint would see the development of a cotton mill and textile industry, a rope walk, brick kiln, cobalt and slate mining, a new road alignment, hotel and a regular coach service to connect the city with the packets. There has also been rumor of ship building in the village. All of these developments centered around the Packet, but from early on, there was criticism. Given that the ships relied on wind power, and that Cheekpoint was so far up the harbour, there was much disquiet and criticism. The authorities were looking at moving the station further down the harbour to Dunmore East. We will look at this, and some of the enterprises mentioned above, in more detail on the blog in the coming weeks. What of Elizabeth however. Well her parents Thomas and Jane Owen had ten children, but many died in childbirth or very young. Four survived to adulthood; Eleanor, Elizabeth, William and Samuel. 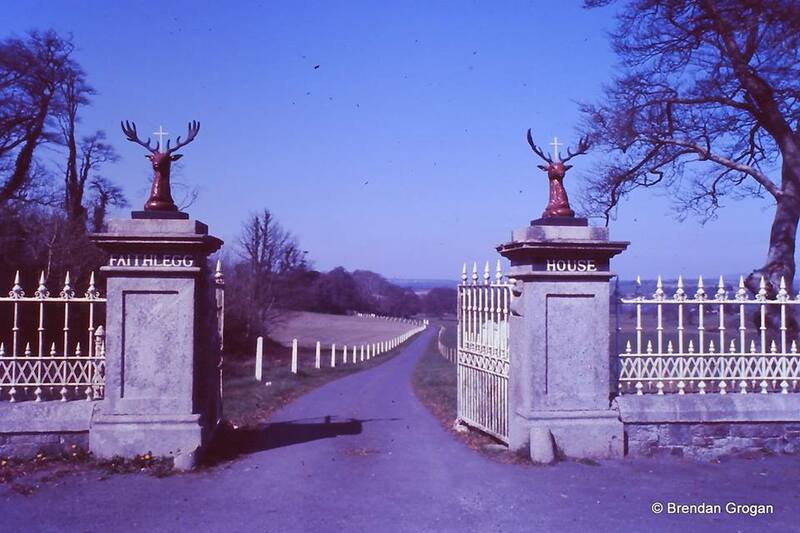 Her mother Jane died at Cheekpoint in 1811 and her father followed his wife in 1813. These times are reflected on by Elizabeth and there is much sadness and loneliness evoked. There is also, of course, many pieces that give a sense of the village, the maritime connection, her love of nature and and her privileged position within the community. The death of Thomas Owen, was a prelude to what would befall the village, Cornelius Bolton and the packet. Following his death, but probably not because of it, the Mail Packet station moved back to Passage East. Bolton was forced to sell off parts of the business and his land to repay his debts, culminating in the sale of his mansion at Faithlegg to Nicholas Mahon Power. The Packet would later be taken from private enterprise when in 1823 the Post Office took over the role and of course Steam was on the way too! Coincidentally, Thomas died on July 24 1813. To borrow a phrase from a man very popular here in Waterford – On this day! Please join us on Saturday 22nd August at 5pm at Cheekpoint Quay to explore the poetry of Elizabeth Owen and Cheekpoint’s Industrial Age. We will also provide our regular walks, as part of the week, Cheekpoints Maritime Trail will run on Wednesday 26th and the Faithlegg Heritage Tour will run on Sunday 23rd & 30th. Details on our website at www.russiansidetours.com or via the links above from the Heritage Council website for the week. Daisybank house, was a derelict three story Georgian mansion when I was growing up. Its only saving grace to me with its shattered windows and crumbling brickwork was an old orchard at its rear, with some very flavorsome apples. A visit to those apple trees was one of the mainstays of our summer schedule. There is a wonderful architectural description on the listing of the buildings of Ireland. There are additional images here. Its interesting to note that it considers the property to date between 1750-1780 and speculate that it may have been built as a harbour masters home or a constabulary barracks. Despite searching, I haven’t yet found any evidence of same. Daisybank opened as a Coaching Inn in 1793, serving the mail packet station at Cheekpoint which originated with the local landlord Cornelius Bolton. 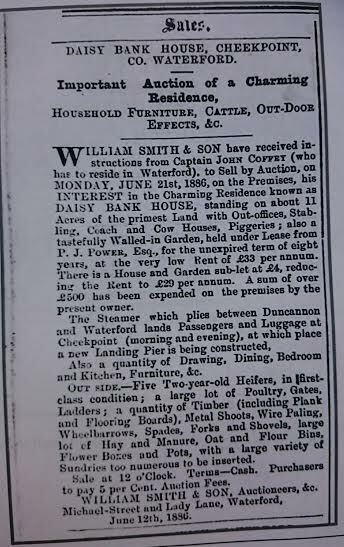 We know the date as the hotelier, J. Sly advertised his new Inn in the Waterford Herald. 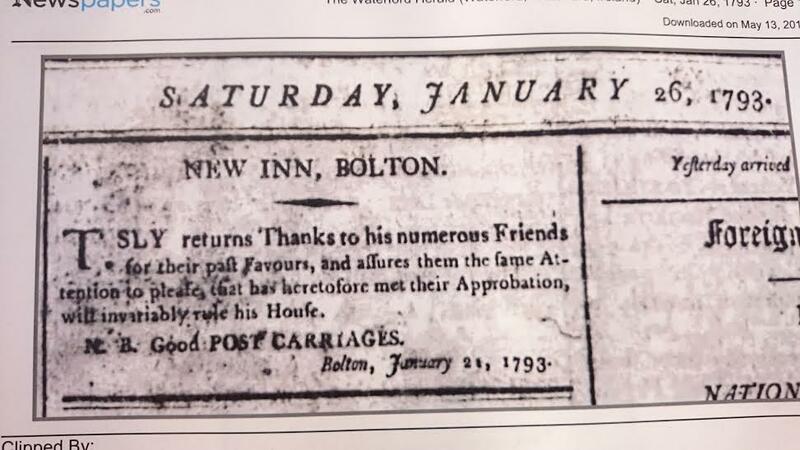 The advertisement is dated as January 21st 1793 By calling it a new Inn, I think it safe to assume that the old inn is what we now know as McAlpins, Suir Inn. The next mention that we find is an advertisement from May 12th 1801, The lease is open to be filled immediately, and states that it was lately occupied by one William Jackson. The mail Packet moved to Passage East in 1813 and with it the hotelier Howley.4 His reputation must not have been all bad as a hotelier! Frustratingly there is no record to be found from 1813 to 1848, But in 1848 Patrick Tracy was leasing this property from the Power estate when it was valued at over £18. He was still there two years later, and interestingly, it was then being used as a hotel. We can only speculate that it remained so during this period. Although you might think that there was not a lot of call for a hotel in the village at that time, accounts of shipping and other happenings on the river highlight a vibrant level of trade in and out of the harbour. A piece from the Waterford News 7th June 1850 gives an example of a Sunday afternoon in the village. We learn that the quay was “crowded with boats of all kinds and sizes” The monied class of the city were escaping downriver to spend a day boating, walking “beauteous walks”to the Minaun and there views that “could hardly be excelled” Tracey is running a table d’hote which on the day is “filled to overflowing” The entire piece is given below. I could only find one other mention of the house, dated 1886. The Advertisement is below, but in brief a certain Captain Coffey is putting up the lease on his “charming residence”. The lease is for 8 years and the present owner (Patrick Power of Faithlegg House) has expended £500 on improvements. The rent is £29 per annum. Aggie Power came to live in the house in 1888 according to her grandson Deaglán. she was four months old at the time. Wonder did the family move in as a result of the above add. Aggie lived to be a great age and had a lifetime of stories connected to the house. Alas I never knew the lady but Pat Murphy told me before of her remembering workers employed on the building of the Barrow Bridge staying as boarders in the house. The Bridge opened in 1906. In the 70’s it was bought by a Londoner named Bert Almond, a gentleman, who had a holiday home on the road below beside the pub. Bert could see the potential that others could not, but in the early 1990’s he sold it to a developer named Pat Fitzgerald, who had the skills and the cash to turn it into what it is now, a fully restored and eye pleasing family home. It’s now the family residence of the Nevin McGuires and long may they happily reside there. My thanks to my cousin James Doherty for all the new paper clippings contained in this piece. Thanks also to Deaglán De Paor and Susan Jacob for information on the Power family. built a Motte and Baily to secure his position and it became the centre of Faithlegg Parish, which existed until amalgamated with Crooke & Killea in the mid 18th Century. The name has featured widely down the ages, probably because of its strategic importance and the presence of Aylward and latterly his Bolton and Power successors. Frustratingly however, each time it featured it seems to have had either variations of its present name, or widely different names. These are very helpfully gathered on the Logainm website for your perusal, Initially it seems to have been spelled as Fathelig and this name has had several corruptions. But it has also been called BalyFalyng, Whalyng and even Thatlegg. think, to go further for an explanation of the name. I think that this account is a bit wide of the mark. From a desk you might think it makes sense, but knowing the geography of the area and the amount of pudding stone found on the summit, would challenge it. The slate mentioned is found on the Northside, but down towards the river on the Glazing wood side. I’d imagine it’s related to the quarrying that went on to build the marsh embankments, than anything older. Br Lawrence O’Toole (responsible for the creation of the secondary school in De La Salle College) in his “The Faithlegg Story” agrees. He goes on to consider that Minan Fheilinn may be an origin. The Minaun obviously which he equates with height, but who or what is Fheilinn. A person perhaps? Br O’Toole also considers that it might be a Gaelic term for Woodbine or Honeysuckle. Woodbine does grow on the Minaun presently but I don’t think anyone would say that it grows to such an extent that you would name the area after it. Perhaps in the past? Canon Power tends towards the woodbine theory, but interestingly he also thinks that the name may not be gaelic at all! His Place Names of the Decies here. So is it an old danish name or the tongue of some other tribe, who settled the area in the past and left a name to posterity. None other that John ODonovan of the original ordnance survey, and noted Irish placename scholar was of a similar opinion. But he felt that the anglicised spelling of the placename as he found it, was closest to the original meaning, whatever it was, as listed in the older documents that he had access to.